If you want a fall vegetable, try growing snap peas! Yummy and nutritious, this pod plant can be planted in the fall because it is a cool weather crop. Some pod plants can withstand temperatures down to 20 degrees fahrenheit! Snap peas take about sixty days to reach maturity from seed to flower and are self pollinators. They are a great source of vitamins C, K, and A, and the vines they grow from is visually appealing and pretty! Raised bed? Yes, please. Plant the seeds at least two inches apart and about a finger length deep. Plant them in nitrogen rich soils. Don’t forget to “inoculate” your soil against bacteria and fungus that can damage your crop. There are many organic options to consider. Give them time to take root. Snap peas are a cool weather plant, however, frost will kill young seedings that haven’t taken root. So be sure to give them ample growing time before the first frost arrives. You might consider growing the seed in ice cube trays and bringing the trays outside for sun and indoors at night. Trellis it! As a pretty, vining plant give the peas a leg up by placing a wooden stake at each end of each row of peas you wish to grow. Make sure the stakes are well-established in the ground and string some twine between the stakes at the top and bottom. You can also fill in the gap between the top and bottom strings with more twine wound in a zigzag pattern. Then help the vines grow upwards by wrapping the ends around the twine (where the vines will spread on their own afterwards). This can take a few days so keep at it till the vines attach themselves. Cover them. 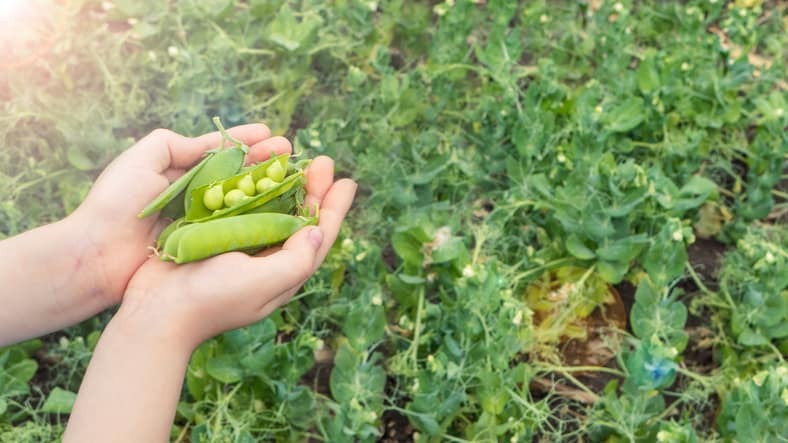 You can protect your peas from hard freezes by covering the rows with either a row cover or a light-weight blanket or plastic bag.